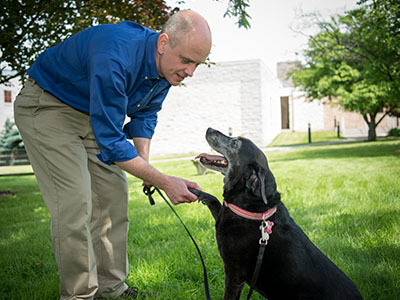 Dr. Alex Travis’s research explores a diverse set of subjects related to One Health, which is interdisciplinary work that links the functions and wellbeing of people, animals, and the environment. His interests include animal health and fertility as well as efforts to help alleviate poverty and hunger in developing countries, work that indirectly benefits local wildlife. 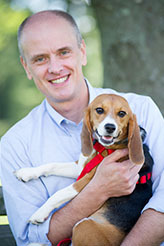 Dr. Travis serves as Associate Dean of International Programs and Public Health at the College of Veterinary Medicine, and is founding Director of Cornell’s new Master of Public Health program. Male infertility, assisted reproduction. Poor sperm function is a common cause of infertility in animals and humans alike, but there are currently few easy and accurate tests for diagnosing the problems involved. Building on his expertise in sperm biology, Dr. Travis and his team have developed a male fertility test that scores the likelihood that a man’s sperm will be able to successfully fertilize an egg. For humans, this result can help doctors direct a couple seeking to have a child to the assisted reproduction approaches that can serve them best. Puppies born by in vitro fertilization help dogs, wildlife. Dr. Travis and his colleagues and students welcomed the first puppies born by in vitro fertilization on July 10, 2015 at the Baker Institute. The births are the first time this assisted reproduction technique, in which ova and sperm are brought together in a test tube to create embryos, has been successfully accomplished in a dog. This advancement could provide new strategies for preventing human and canine genetic diseases. To assist wildlife conservation efforts, the techniques are now being applied to help endangered canid species reproduce in captivity. Rapid diagnosis of stroke, other disorders. Minutes count when treating stroke or other brain injuries, but current diagnostics take as long as three hours – during which time patients may be suffering from irreversible brain damage. Copying a molecular design they discovered in the sperm tail, Travis and his colleagues, including Baker Institute Research Scientist Dr. Roy Cohen, have developed a device that can diagnose stroke in less than ten minutes using less than a drop of blood. Having demonstrated proof of principle, Travis and Cohen are now expanding the technology to diagnose other conditions in humans and animals, including traumatic brain injury (concussion), some forms of dementia, and even some types of cancer and heart disease. Getting sperm tail enzymes to do important work. Sperm are interesting because of their role in reproduction, but the Travis lab is also putting components of the long sperm tail to work for other purposes. Building on their past studies of sperm’s energy-making enzymes, Dr. Travis and his colleagues have mimicked the way these enzymes are organized in the tail, called a “flagellum”, to create enzyme machines powered by sugar. If the work can be enhanced to be a net producer of energy, these molecular engines could enable a number of practical applications in nanobiotechnology. For example, these tiny powerhouses could be integrated into implanted hybrid biological/mechanical medical devices, which would diagnose or treat disease, fueled by the sugars available in a patient's bloodstream. Wildlife conservation and fighting poverty and hunger. In developing nations, Dr. Travis and his team focus on landscape-scale, business-based interventions that fight human poverty and hunger. Currently, he is mentoring a student who is designing, implementing, and testing economically and environmentally sustainable interventions to improve rural poultry production. Together with the non-profit business COMACO, Dr. Travis and his student are developing egg layer facilities in remote rural communities in Zambia in an effort to make chicken eggs more available in areas with persistent poverty and hunger. To evaluate whether the program is successful they are measuring the impacts this local egg production might have on the health and nutrition of mothers and children. Dr. Travis discusses his work in a video from our online annual report. Read more about his work in the report.